I am such a lucky girl. I have had the pleasure of visiting Big Sur twice this year. Twice! I am so lucky I have stood on the cliffs above the Pacific coast and watched the waves crash on a rocky beach with purple sand. I’m so lucky I can say I’ve watched a waterfall soar 800 feet down to the beach. The drive down to Big Sur along Highway 1 is breath-taking. My favorite part is the stretch along the coast where strawberries and artichokes grow on the back sides of the sand dunes. I love stopping at road side stands for fresh fruit and vegetables. No trip is complete without a stop at Pezzini’s to get a bag of 12 artichokes for $1. Yesterday, I also picked up a flat of strawberries. Most people think of strawberries as being in-season only in the spring, however, the central coast of California grows strawberries almost year-round. (A few months out of the year, strawberry production moves to Arizona). I guess I should tell y’all now that I work in agriculture (if it’s not already obvious). So before pumpkin desserts start taking over your oven, make a strawberry dessert one last time. It’ll be worth it, I promise. Before baking a pound cake, I recommend setting out all ingredients on the counter and allowing them to come to room temperature. Butter a 5 ¾” x 3” x 2” mini loaf pan Preheat the oven to 350°. In a medium bowl, beat together the butter, cream cheese and sugar with an electric mixer. Beat very well (about 3-5 minutes) until the sugar is fully incorporated and the mixture is pale yellow and fluffy. Next, add the egg and vanilla and continue beating. Add the baking powder and half of the flour. Add the remaining flour and mix just until combined. Scrape batter into the pan and bake on a cookie sheet for 42-45 minutes, or until a toothpick inserted comes out clean. Before you plan to serve the pound cake, mix the strawberries, sugar and lemon juice or Frangelico and let macerate for 30 minutes. 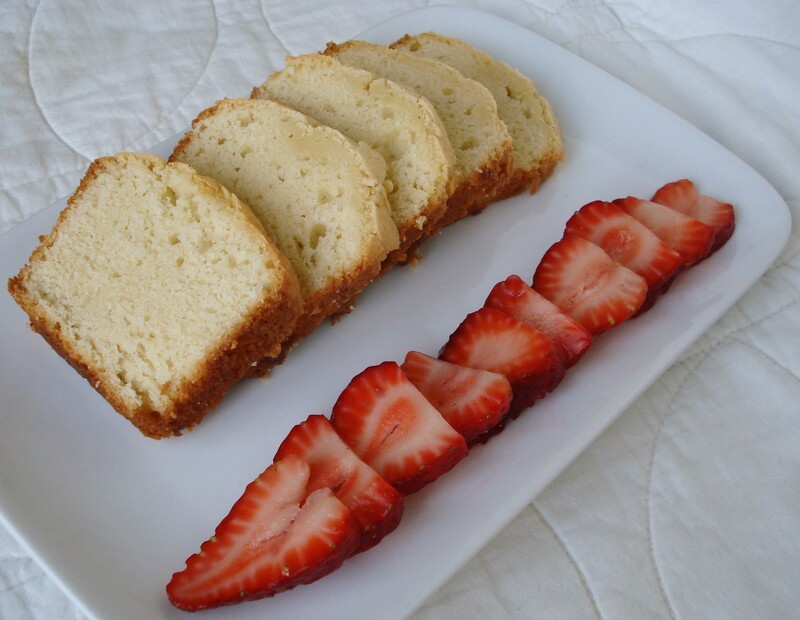 Serve fat slices of the pound cake with juicy strawberries. Garnish with whipped cream if desired. I love the idea of the cream cheese in the pound cake! I love using cream cheese in baking. This pound cake sounds phenomenal! Looks like the perfect texture and crumb for a solid pound cake- Dense, but still pillowy soft. Mmm! Popped in to say hi! I’ve been meaning to make pound cake forever! This looks wonderful! I happened upon this site today while searching for a recipe for two to get rid of some strawberries. The pound cake is amazing! The cream cheese gives such a nice flavor. I think next time I’ll use grand marnier in the strawberries. Just a personal preference. I am so glad I found your blog. When I make traditional desserts, they go to waste. I will be back! Great job! Love your Blog!! Just made is with my daughter for my anti-dessert husband and it was just the right amount! How do I sign up for your blog. I love your recipes. It’s the beginning of strawberry season in Florida – and while they are good on cereal – I was craving pound cake. I did not want or need a whole pound cake in the house, so I checked with you first, and you did not disappoint. We ate most of the pound cake with strawberries for dessert – there’s enough left for my breakfast. It was so good – tasted just like the big tube pan pound cake I usually make – but without all the fuss. Husband loved it, so will most likely make another tomorrow – since we still have strawberries. Thank you!